Ted Bromund is the Margaret Thatcher senior research fellow at The Heritage Foundation and dropped this little piece of coal in my stocking just before Christmas. This is not the first article critical of the Mine Ban Treaty published by Mr. Bromund and the Heritage Foundation. They also published this piece in December 2010, this one in September 2014 and this article in December 2014. Mr. Bromund’s colleague at the Margaret Thatcher Center for Freedom, Daniel Kochis, published this piece in June 2014 in response to the Obama Administration’s change in landmine policy announced at the Mine Ban Treaty Review Conference in Maputo, Mozambique. There are a few major fallacies in the most recent piece which was a response to the release of this year’s Landmine Monitor report, a report I had a hand in writing so I feel a bit more sensitive to this critique than previous ones. First, the picture accompanying the article shows a truckload of anti-tank mines which are not regulated by the Mine Ban Treaty. The photo below would have been a far more appropriate picture which shows several South African-made R2M2 anti-personnel mines. Mr. Bromund is welcome to use this photo with proper attribution. Second, Mr. Bromund points out that “U.S. land mines are not responsible for any of these casualties.” He goes on to say that “a ban on U.S. land mines won’t help, for the simple reason that U.S. mines aren’t killing anyone.” And technically he may be right: US-made landmines probably didn’t kill anyone in 2014, but US-bought landmines almost certainly did. As a small example consider Angola which reported 11 landmine casualties in 2014 (a number which almost certainly does not reflect the true number of casualties). Those casualties were the result of landmines laid by government forces and UNITA rebels during the course of the three-decades long civil war in Angola. During the war, the government was supported by the Soviet Union and Cuba and the Soviet Union sent many landmines to the government as part of military aid packages. These mines would have been made by the Soviet Union or its allies including East Germany, Yugoslavia and Czechoslovakia. UNITA was supported by the United States government and received military and logistical support, but not through direct channels. Much like other clients of the US during the Cold War, UNITA received arms and weapons made not by the US, but by NATO allies like Italy and Belgium or geographically closer allies like South Africa and Zaire. This allowed the US to retain “plausible deniability” for supporting rebel groups against internationally-recognized governments. Now, can I prove that any of the 40 landmine victims in Angola were injured by a US-made landmine? No, but the possibility is very strong and Mr. Bromund knows this. Third, Mr. Bromund says “a U.S. ban offer any kind of moral lesson to others.” Wrong again. Only two countries in the Western Hemisphere maintain stockpiles of anti-personnel landmines, the US and Cuba. And Cuba has explicitly said it will continue to retain landmines as long as the US does. Also, the former Soviet republic of Georgia has said that if the United States feels anti-personnel landmines are a necessary part of its arsenal, then Georgia would view them the same way. Therefore, if the US were to ban landmines, at least two countries would lose their justification for not doing the same. Fourth, Mr. Bromund claims “Repeated studies have found that no other weapon can protect U.S. forces and civilians as reliably as land mines.” The studies Mr. Bromund cites are from 1999, but a 2002 Government Accountability Office (GAO) study, GAO—2-1003, “U.S. Use of Land Mines in the Persian Gulf War,” which specifically looked at US military landmine use in the first Persian Gulf War (Mr. Bromund’s studies looked at models and theories of landmine use, not actual use). According to the GAO, the US military only used 118,000 “self-deactivating” mines in the Gulf War despite having access to millions of persistent mines. Of those 118,000 mines, there is no evidence that any of them “actually caused or contributed to enemy losses.” Also, Iraqi forces were not “aware of or have actually encountered” landmines used to protect defensive positions. So, US mines were completely ineffective and 81 US soldiers were confirmed killed or injured by Iraqi or “unknown” landmines. And while no evidence was found that US landmines caused US casualties, the Department of Defense confirmed that US-made and used cluster munitions caused 80 casualties among US service members; other unexploded US ordnance caused 16 more US casualties. So, as the GAO report points out: more US casualties were caused by US cluster munitions and UXO than Iraqi landmines. The GAO report goes on to highlight significant reliability issues with self-destructing mines which had a dud rate in the Gulf War of 100 times that reported by the Department of Defense. So while Mr. Bromund suggests that US landmines protect soldiers and civilians reliably, the actual evidence is otherwise. Lastly, Mr. Bromund in his December 2010 commentary trotted out the tired chestnut that eliminating landmines from the US arsenal “would seriously degrade the ability of the U.S. to defend itself and its allies, particularly in Korea.” The Korean Peninsula remains the one place where the US will continue to allow use of anti-personnel landmines even though, get this: the US does not have a single landmine in Korea. All of the landmines on the Korean Peninsula belong to North Korea or South Korea. The US maintains this exception because, in the case of an attack on South Korea by North Korea, the US would assume military control of South Korean forces and therefore South Korea’s landmines. The US commander in Korea has said that the one million South Korean landmines prevent a North Korean invasion, but that claim represents a serious failure to comprehend the dynamics of the conflict. Landmines are not what prevent the North Korean army from marching across the Demilitarized Zone; the threat of a US nuclear strike does. North Korea’s government allowed as much as a tenth of its population to starve to death in the 1990s. A government so callous would think nothing of sending a division of troops to act as human mine-clearers in advance of a mechanism invasion. And what was North Korea doing while its people starved? Developing atomic weapons to use as a deterrent in case they did make an assault on South Korea. Pyongyang’s pursues nuclear capability (and the means to reliably deliver warheads) to counter the perceived US threat that exists as long as South Korea remains under US protection. The Korean conflict is a nuclear one, not a conventional one and any general, US or otherwise, who doesn’t realize that and relies on landmines to sleep well at night is mistaken. I don’t know why the Mine Ban Treaty and efforts to eliminate landmines bother Mr. Bromund so. Any military usefulness for these weapons is dwarfed by their humanitarian impact which extends way beyond just the immediate casualties of landmines. More than 12 million people live in areas affected by landmines, limiting their access to water, agricultural land and markets. Most of these people are not in active conflict zones are suffering the after effects of wars that ended a generation or more ago. Mr. Bromund and the Heritage Foundation should be applauding the US’s leadership on this cause, as the US is the single-largest donor to mine clearance around the world, not trying to undermine it with flawed and specious arguments. Or perhaps there’s a simpler explanation. South Korea’s Hanwha Group was, in 2014, one of ten donors to give at least US $1 million to the Heritage Foundation (2014 Annual Report). Hanwha Corporation was founded as an explosives company in the 1950s and remains one of the world’s largest producers of defense munitions (Hanwha Profile). Those munitions include cluster munitions and landmines (The Monitor; Plunkett Research; IDEX). Just saying. On March 12, 2015, an officer in the Sudan People’s Liberation Army (SPLA), the Army of the Republic of South Sudan, admitted that the SPLA violated the Mine Ban Treaty when he “stated clearly that anti-personnel mines has been deployed in the area around Nassir,” in South Sudan’s Upper Nile State. The Inter-Governmental Authority on Development (IGAD), which is tasked with monitoring the Cessation of Hostilities Agreement signed by the Republic of South Sudan and the rebel movement known as the SPLA In Opposition (SPLA / IO) and loyal to South Sudan’s ousted vice president, Riek Machar, documented this admission and has reported it to the Peace and Security Department of the African Union (IGAD). This admission by the SPLA corroborates claims made by the SPLA / IO in February (Sudan Tribune) and early this month (Nyamilepedia) that the SPLA has been using anti-personnel landmines around Nassir (also spelled Nasir and Nasser). 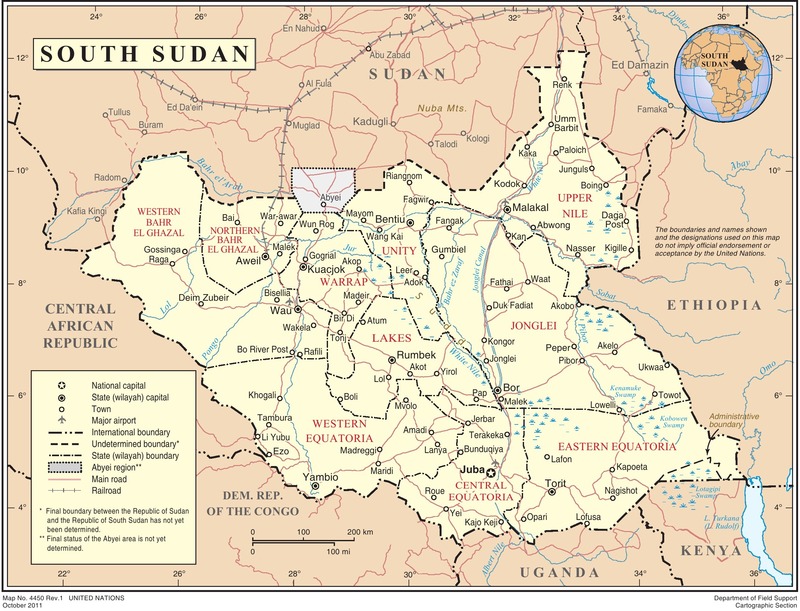 Political Map of South Sudan showing States. Upper Nile is the northeastern-most state, and Nassir is in the south of Upper Nile State. IGAD has called on the government of South Sudan to clarify the claims of anti-personnel landmine use and asked the Special Envoys to the Cessation of Hostilities Agreement to “issue a strong statement against the use of any sort of landmines by the Parties to the present conflict” (IGAD). In response, the SPLA’s spokesperson, Army information director Malaak Ayuen, denied any use of banned weapons saying that only barbed wire is being used. Ayuen also invited IGAD officials to travel to Nassir to verify for themselves (Bloomberg). This admission is not the first suspected violation of the Mine Ban Treaty by the Republic of South Sudan. In the course of the current conflict between South Sudan and the SPLA / IO, the use of anti-tank landmines and cluster munitions have been documented, but South Sudan has denied the claims, blaming rebel forces for their use (AP Mine Ban Convention; The Monitor) and falsely accused the United Nations peacekeeping mission of using landmines (Landmines in Africa). On March 16th, Machar wrote to the United Nations headquarters to request a verification mission alleging more than 80 landmine and cluster munition related incidents; 20 of which have caused human casualties (Bloomberg). If the SPLA has used banned anti-personnel landmines, there is the question of where the mines would have come from. The SPLA renounced the use of anti-personnel landmines in 2001 when it signed Geneva Call’s Deed of Commitment, more than four years before the signing of the Comprehensive Peace Agreement which ended decades of civil war in Sudan and allowed for the creation of South Sudan as an independent country (Geneva Call). South Sudan acceded to the Mine Ban Treaty within five months of becoming an independent state in 2011 and shortly thereafter declared that all known stockpiles of anti-personnel landmines had been destroyed (The Monitor). The destruction of all anti-personnel landmines in South Sudan has been re-confirmed several times. Therefore, if anti-personnel landmines were used by the SPLA in Nassir, the mines would have either been newly imported, or from previously unreported stockpiles. Also, Nassir has previously been identified as a suspected hazardous area likely contaminated with anti-personnel landmines (AP Mine Ban Convention). 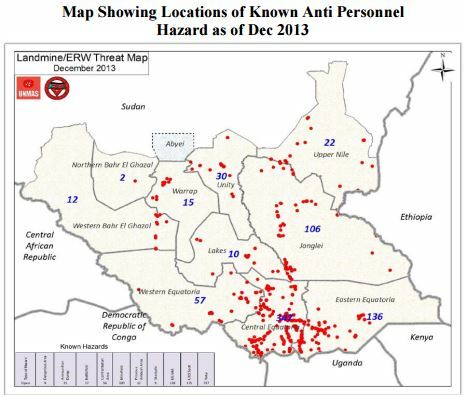 Known areas of anti-personnel landmine contamination in 2013. From the South Sudan Mine Action Strategy, 2012 – 2016. It is possible that the earlier landmine contamination would cause the injuries reported in February, which also injured a naturalized US citizen fighting with the SPLA / IO, but would not explain why an officer of the SPLA would admit to new usage. The Republic of South Sudan needs to respond to the claims of its officers. If the claim cannot or is not repudiated, then a verification mission should travel to the site of admitted use and document what mines, if any were used. If banned anti-personnel landmines were used by the SPLA, the origin of those mines must be determined. At this point, it is up the Republic of South Sudan to prove its innocence after the admission of its officer on March 12. This week marks the annual observation of International Day of Mine Awareness and Assistance in Mine Action (Saturday, April 4th); it would be very poor form of the Republic of South Sudan to raise awareness of landmines by actually using them. When language gets in the way of good news: Is Zambia “landmine-free”? In recent months, we’ve discussed Zambia and noted that there appears to be confusion over whether or not there are any landmines in Zambia. Recently I had the opportunity to speak with Bob Mtonga, a Zambian physician and disarmament advocate, and he explained to me the situation which is this: to the best of anyone’s knowledge, all known landmines have been cleared from Zambia. However, because landmine use in Zambia was “nuisance” mining without any specific pattern, there remains the possibility that previously unknown and undocumented landmines could be found in Zambia. This possibility prevents the Zambian government from making any statements, definitive or otherwise, about whether or not Zambia is landmine-free. Which is understandable. If Zambian officials declared the country landmine-free and someone where to discover or be injured by a mine, then the credibility of the government and the landmine clearance process could be called into question. However, the government’s equivocation on the subject and silence when asked directly leads to fears that the country still has a landmine problem. Already, in response to the uncertainty, the British government has revised its travel advice for Zambia which could impact tourism in the country. So, what can a country do in this situation? And, can a country ever announce that it is truly landmine-free? Compliance with Article 5 of the Mine Ban Treaty means that all known anti-personnel landmines have been cleared from a country. A country can still have known anti-vehicle mine contamination and be compliant with the Article 5 because the Mine Ban Treaty’s obligations are specific to anti-personnel landmines. Compliance only affects the 162 countries party to the Mine Ban Treaty. Landmine impact free (as defined in the International Mine Action Standards) can mean that a country may still have landmines, anti-personnel or anti-vehicle, but such mines do not have a negative socio-economic effect on communities. Countries not party to the Mine Ban Treaty can (and often do) aspire to being landmine impact free. “Compliant with Article 5” and “landmine impact free” are both time-specific descriptions. Because compliance with Article 5 means only known landmines are cleared, a country that has previously declared itself compliant with Article 5 can identify previously-unknown minefields and still be compliant. This happened in Burundi and Germany and the governments then proceeded to clear the newly discovered minefields. Because landmine impact free refers to the absence of negative socio-economic effects on communities, there is the possibility that changes in a community would change the effect existing landmines have on that community. For example, a particular community could exist for some time next to a marked and known minefield but when that community grows in population and begins to need additional agricultural land to support itself, the community might encroach upon the minefield because there is no other available land for farming. By definition, a country that has completed landmine clearance under Article 5 is landmine impact free. So where does that mean for Zambia? Zambia is in compliance with Article 5 of the Mine Ban Treaty. Zambia is landmine impact free. Is Zambia absolutely landmine free? Maybe, maybe not; but Zambia should be proud of clearing all known landmines and fulfilling its obligations under the Mine Ban Treaty and should not be silent about it. Zambia’s foreign minister Harry Chiluba has been traveling throughout the country to reassure Zambians that there are no known landmine dangers in the country and that should any threats be discovered, the government will respond swiftly and fulfill its obligations to survivors and victims of mines. Thus, Zambia is doing everything it can to live up to the aspiration of being landmine free. Anti-personnel landmines are specifically banned by the Mine Ban Treaty, which 162 countries have agreed to be bound by, and regulated by Amended Protocol II of the Convention on Certain Conventional Weapons, which key Mine Ban Treaty hold-outs China, India, Pakistan, Russia and the United States are party to. The dramatic reduction in casualties from anti-personnel landmines is largely due to these two treaties which were negotiated and came into force in the late 1990s. However, both treaties specifically avoided regulation or restriction on the production, transfer and use of anti-vehicle (or anti-tank) landmines. As a result, anti-vehicle landmines probably present a greater humanitarian threat than anti-personnel landmines. Over the last decade or so, a group of countries, led in large part by the United States, has pushed for a new protocol for the Convention on Certain Conventional Weapons (CCW) that would specifically address the humanitarian impact of anti-vehicle mines, or “mines other than anti-personnel mines” (MOTAPM) as they are referred to in the CCW. Recently, the Geneva International Centre for Humanitarian Demining (GICHD) and the Stockholm International Peace Research Institute (SIPRI) published a report on the humanitarian and development impact of anti-vehicle mines. The report compiled existing research conducted by the International Campaign to Ban Landmines (ICBL) and the International Committee of the Red Cross (ICRC) and added in three country case studies to demonstrate the findings reported by the ICBL and the ICRC. The report showed that the impact of anti-vehicle mines may actually be increasing as post conflict countries like Cambodia develop as well as the fact that new mine usage in South Sudan appears to be entirely anti-vehicle mines. The report recommended regulating the use of anti-vehicle mines to reduce their humanitarian impact and regulating the production of the mines to ensure detectability. As of today, the only restriction on the production of anti-vehicle is that they cannot be designed so as to detonate in the presence of a metal detector or similar mine detection equipment. The only regulations on their use is they cannot be used “indiscriminately” or to deliberately target civilians. There are no regulations on their transfer, except those imposed by individual nations (e.g., the US will not export any “persistent” anti-vehicle mines). Since 1997, anti-personnel mines have been required to contain a certain amount of metal to ensure detectability by metal detectors or similar devices; anti-vehicle mines have no such requirement. The Arms Trade Treaty, when it comes into force later this year, will restrict transfer of anti-vehicle mines (and a host of other military equipment and items) to countries in conflict or where gross violations of human rights, including gender-based violence, are occurring. That’s a good start, but the damage has been done. When the Gaddhafi regime in Libya fell, hundreds of thousands of stockpiled anti-vehicle mines were looted by various militias. Other countries, like the Central African Republic, which had eliminated their stockpiles of anti-personnel landmines in accordance with the Mine Ban Treaty have been revealed to have stockpiles of anti-vehicle mines. In South Sudan and Mali, humanitarian relief is hampered by the presence of newly laid anti-vehicle mines in roadways. But it’s the old anti-vehicle mines that really demonstrate the horror of these weapons. Earlier this year, in Guinea-Bissau which has cleared all of its anti-personnel landmines, a minibus struck an anti-vehicle mine that had been laid three or four decades earlier killing 22 people. In Egypt, the western desert is polluted with millions on anti-vehicle mines left over from the tank battles of World War II; less than a week ago, eight Egyptians were injured by one such mine. In Cambodia, as the country develops and tractors are introduced to improve agricultural output, farmers are finding anti-vehicle mines in areas that were known to be free of anti-personnel mines, often with tragic consequences. The success of the Mine Ban Treaty has meant that the number of people injured and killed by anti-personnel landmines. But as we see in places like Angola, where deminers find one anti-vehicle mine for every 15 to 20 anti-personnel landmines, the number of incidents involving death or injury from anti-vehicle mines (196) is almost as high as the number from anti-personnel mines (247). A ban on the use of anti-vehicles mines would complete the promise of the Mine Ban Treaty. Next month, the parties to the Convention on Certain Conventional Weapons will convene for their annual meeting. One of the major points on the agenda for the CCW is the continued discussion about lethal autonomous weapons (or “killer robots”), but another issue will be the humanitarian impact of anti-vehicle mines. The governments of the United States and Ireland previously supported attempts to address the dangers poses by anti-vehicle mines and reduce their negative humanitarian impact. The government of Russia has been one of the strongest opponents to any new protocol to the CCW that would limit anti-vehicle mines saying that such weapons have military utility and any protocol would not prevent the “irresponsible use” of anti-vehicle mines by “terrorists” and non-state actors, which are the cause of any civilian injuries. The Russian government also feels continued discussion about anti-vehicle mines to be “hopeless” because the “humanitarian concerns regarding these mines have not been substantiated.” The difference in opinions is simple: the Irish have stated that anti-vehicle mines “have clear indiscriminate effects and that these are not adequately addressed in existing IHL [international humanitarian law]” and the regulations imposed by Amended Protocol II of the CCW are insufficient. The Russians state that “full compliance with the IHL norms” and Amended Protocol II are sufficient to prevent any “’specific’ humanitarian threat” from anti-vehicle mines. Requires states and deminers to differentiate between anti-personnel and anti-vehicle mines in clearance reporting. Each State Party undertakes to destroy or ensure the destruction of all anti-personnel mines in mined areas under its jurisdiction or control, as soon as possible but not later than ten years after the entry into force of this Convention for that State Party. Too many countries have not met this obligation. Some have missed the deadline due to the extent of contamination, e.g., Cambodia and Afghanistan, but others have simply failed to put forth the effort to clear their minefields despite having the capacity to do. Blaming mismanagement and shortfalls, Chad has requested an additional ten years to clear its minefields; a request that has been granted despite the country’s ability to complete the task faster. Chad’s minefields, almost exclusively found in the northern area of the country, come from the 1973 invasion of Chad by Libya and decades of internal conflicts and cover some 128 square kilometers, about double the size of Manhattan Island in New York City. Unexploded ordnance (UXO) is found in the north, east and west of the country, but only covers a little more than 3 kilometers. Despite this limited area of contamination, roughly 0.01% of the country, Chadian officials have talked about minefields covering “vast swathes of territory” (AP Mine Ban Convention; The Monitor). The limited landmine contamination in Chad has had an outsized impact on the population. More than a hundred people are killed or injured by mines every year due to the highly mobile nature of Chad’s population, many of whom are pastoralists. Chad also has a very large refugee population with nearly half a million refugees, equivalent to almost a tenth of the country’s population, fleeing conflicts in Sudan and the Central African Republic, and refugees are one of the most at-risk groups for landmine injuries (IRIN News; ACAPS). In the past, Chad has explained its inability to address the landmine issue as the result of mismanagement and absence of central leadership on the issue. While there may be some truth to that and certainly the changes in ownership of the mine action issue in Chad would affect the government’s ability to prioritize landmine clearance, it doesn’t not explain the whole story. The United States government, as part of its counter-terrorism and regional security initiative has identified Chad as a key partner. Since 1993, the US government has provided US $11 million to Chad to address its landmine problem and beginning in 2010, AFRICOM has helped “to build capabilities within Chad by instructing local forces on demining, stockpile management, and medical first response.” As a result of that training, “the Chad National Demining Authority assists their American instructors in teaching demining operations to personnel from other countries in the Sahel and throughout the African continent” (State Department). Therefore, the government of Chad has used its newly increased capacity not to address its own landmine contamination, but to train other countries. Instead of first getting its own house in order, Chad has decided to deploy these valuable assets elsewhere. The government of Chad is obligated by its ratification of the Mine Ban Treaty to clear all anti-personnel landmines “as soon as possible.” The training from the US government should be used to meet that obligation before helping other countries to meet their obligations. With a determined effort, Chad could complete its landmine clearance long before its current deadline of January 1, 2020. The US, as a prime supporter of Chad’s landmine clearance work and trainer of its deminers, should encourage Chad to focus on its mines before asking Chad to help neighboring countries. Yesterday the Obama Administration announced another change in the United States’s landmine policy (Washington Post). This change, which bans most uses of anti-personnel landmines by the US, builds upon previous policy announcements while specifically carving out an exception for use on the Korean Peninsula to defend South Korea from a North Korean invasion. At this point, the US could now be fully compliant with the Mine Ban Treaty except for the Korean reservation. Until that reservation is removed, the US cannot achieve the stated goal of accession to the Mine Ban Treaty. One more step, Mr. Obama. The world is waiting. On June 27th, the Obama Administration, via its Ambassador to Mozambique, pledged to end the purchase and stockpiling of anti-personnel landmines and put the United States on a path to joining the Mine Ban Treaty (Reuters). Since that announcement, many statements have come out for and against the new policy. Or rather, many statements are cautiously for the policy, but also call on the administration to do more and those against are firmly against, citing the risk of war on the Korean Peninsula. Here is a round-up. Joe Cirincione, “A Good Step Towards Ending Landmines,” Defense One, June 27, 2014. Lamont Colucci, “Obama is Playing Politics with Landmines: Landmines, believe it or not, save lives.” U.S. News and World Report, July 18, 2014.